Laboratory environments present a dilemma for technicians.Those who work around blood-borne pathogens and other potentially hazardous substances need full-on protection. That means the thicker their gloves, the better.At the same time, they're handling delicate equipment, making precise calculations. 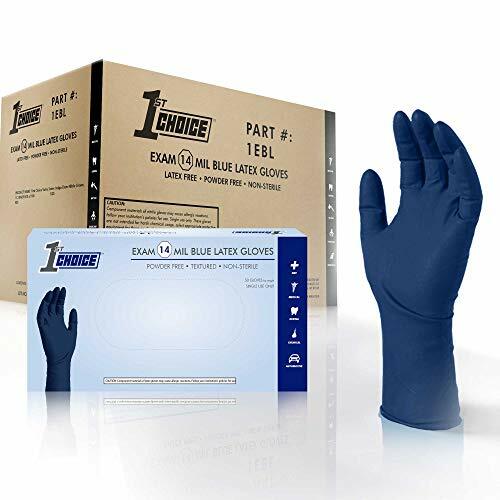 They need total control, all the time.The solution: 1st Choice Exam 14-Mil Blue Latex Gloves.More than three times thicker than standard disposables--with an extended cuff for added protection--they still allow you the magnificent fit, feel, and comfort only latex can offer. Dexterity and tactile sensitivity are off the charts.These are serious gloves for serious professionals.